It doesn’t take a genius to know that the day after the Greek banks are shut down and the Athens stock market closed, equities across the rest of Europe are going to fall; or to use the more euphemistic phrase, be volatile. But have you noticed how markets always seem to recover a little as the day wears on, as the initial view is treated as an overreaction, even if tomorrow is going to bring more selling. Ever wanted to be able to trade that? intellectual opposition to QE and a secret desire to be proved right through inflation, interest rate hikes and goodness knows what political fall out from the unequal distribution of “unorthodox monetary policies”. 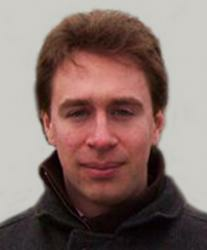 There are a number of ways in which OTAS can help manage money in such an environment. These range from long term analysis of volatility in equities for the patient fund manager, to mean reverting intraday trading analysis for those charged with spotting day-to-day over reactions. Here are some examples of how it works. I’ll use the STOXX 600 for reference, but remember you may use OTAS to analyse any market, sector or your own portfolio, for example to look at defensive and aggressive stocks to see if they will actually behave as they’re supposed to. Implied volatility in options at the back end of last week was suggesting an average three month move in STOXX 600 components of +/- 12.5%. The normal range of this measure over the previous year was +/- 10.5% to +/-12.5%; so a narrow range with the latest figures near the top. The extremes of implied volatility over the past year, beyond which the OTAS red flags really do wave, were +/- 9.5% and +/-13.5%. This is not a wide range at all, barely allowing for a proper correction. To put this in context, let’s look at implied volatility over a much longer period. Here we see the current fluctuations as very minor and bumping along the bottom of the normal range over the past decade. The two periods of far higher implied volatility came at the back ends of 2008 and 2011 and help skew the average volatility over the period to +/-14.25%. Recently, this historic context has been a soothing balm for investors, allowing them to point out how far from the bear market conditions of yesteryear the current market was. However, an event like Greek banks being shuttered focuses attention on how far volatility could rise, even if it were still in the normal range. And this is not good volatility for most investors; we are talking markets falling. This measure will be fascinating for OTAS Subscribers to watch over the coming days and should provide advanced warning of when things calm down again. 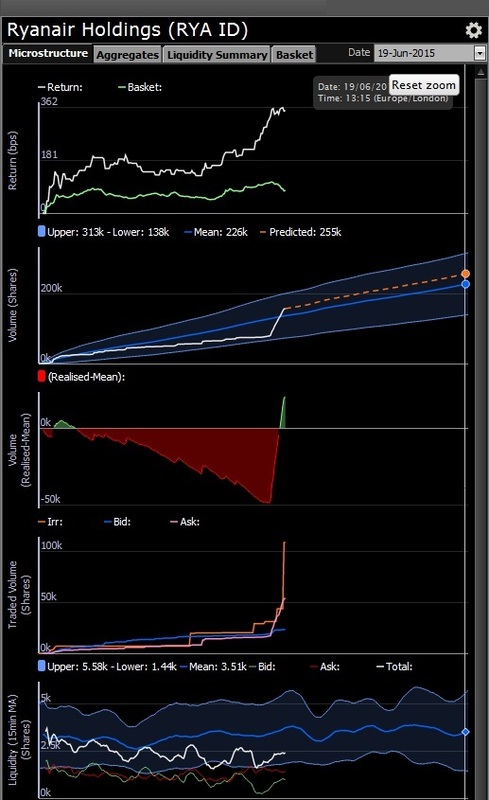 The next thing to do is to rank your investable universe by implied volatility, to check that the option market shares your views of which constituents among your holdings will move around the most in the coming weeks. To a large extent this is intuitive, with the highest volatility stocks those that have been bid for recently (although confirmed cash price bid targets are among the most attractive investments in falling markets) followed by a number of names from the capital goods, energy and technology hardware sectors. The least volatile names are those companies that were bid for some time ago and where deals are awaiting completion, but also Swiss stocks across a number of sectors and some very large cap names in sectors such as Energy. It is worth knowing if you believe the market will correct that option investors expect you to lose less in a relatively small Swiss, diversified financial stock than in a far larger German insurer, or a Dutch food and beverage maker, for example. For those focused on intrade analysis, OTAS Tradeshaper ranks stocks by idiosyncratic performance, meaning stocks that have diverged significantly from the basket of shares that they are most correlated with. Today’s trading is not yet two hours old, but there are a number of stand out performances. 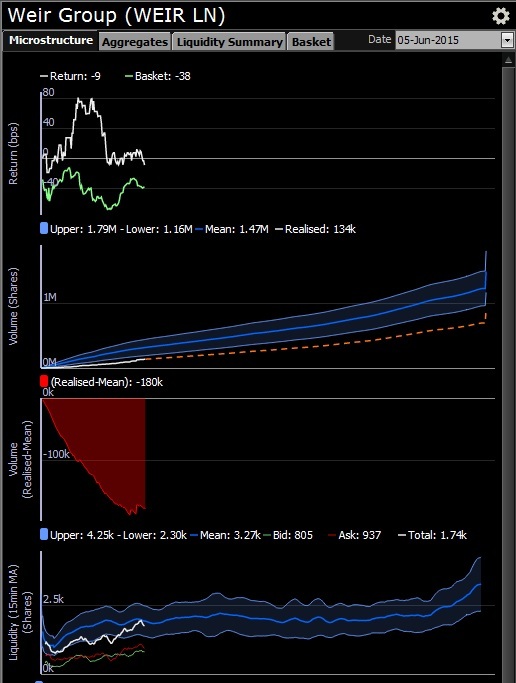 Traders that use OTAS may rank order pads by best or worst performances, volume, bid or offered liquidity and spread, or simply leave TradeShaper to monitor the pad and flash an alert when any of these factors exceeds normal bounds. The temptation is always greatest to focus on your largest orders, often those in the largest shares, or even those where the loudest fund manager demands attention. These are rarely the stocks that require the most attention, or offer the best opportunities to trade now. TradeShaper arms traders to enable better decision making, and crucially provides the evidence to justify those decisions in the heat of the moment and the cold analysis of tomorrow. Over the last few weeks our team of in house experts has been watching idiosyncratic divergence from the norm among large cap, European stocks and using OTAS alerts to pick entry and exit points for intra day traders. The results have been remarkable; to find out more contact support@otastech.com or otassales@otastech.com. Ryanair Intraday Move – Buying Risk Back Badly ! 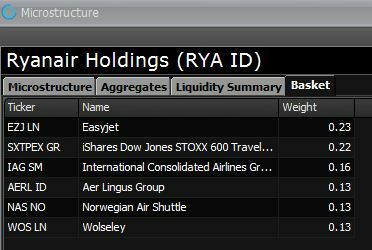 Ryanair shares have spent the morning in positive territory, outperforming a bespoke weighted basket of stock peers. 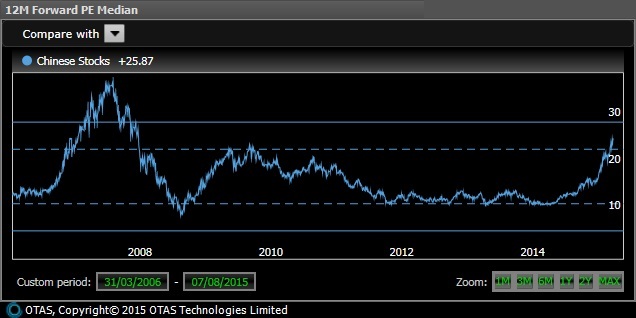 This outperformance has recently accelerated to the extent where the share price change is alerted to as extreme. The OTAS microstructure quickly pinpoints the cause and effect of the reaction….the decision on how to trade next is yours ! At 10.58am an alert fired indicating that the behaviour in Ryanair shares was unusual. The stock had moved 217bps in absolute terms over the last hour. This is NOT typically how the stock would be expected to trade. Pulling up the intra-day microstructure stack(below) it becomes immediately clear what has happened. Buyer(s) were evident from the outset with the stock trading well in advance of its bespoke weighted basket*. No alert fired however, as the percentage move was within the expected historic tolerance range. Volume was low compared to normal and slowing, suggesting little in the way of sell side liquidity for the buyers to transact with. This volume then begins to accelerate considerably at 10.52am as the buyer becomes a lot more aggressive. The effect on the share price is clearly visible whilst the alert indicates their impact on the shares is now significant. A large spike in the orange line is visible. This indicates a large print has occurred ‘off market’ or ‘OTC’ suggesting that the buyer became impatient on such a low volume day and took someone out on risk. 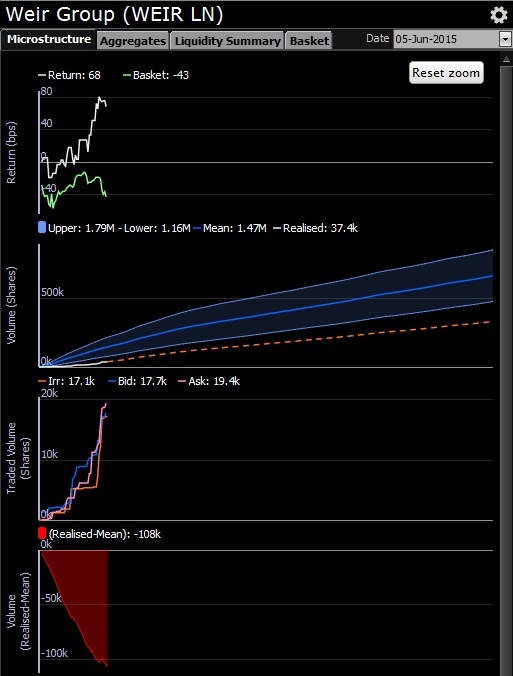 The increase in the pink line shows offer side volume traded (or crossing the spread) as the seller who has gone on risk subsequently panics to buy his stock back. Clearly there has been no finesse in how the market participant has tried to cover back his risk. OTAS Tradeshaper users in receipt of such an alert and the granularity provided by the microstructure may consider this a temporary move and therefore counter the extremely unusual nature of the move. This morning’s OTAS Lingo report on the Stoxx600 highlights 3 companies which appear most undervalued when compared to historical valuation versus their respective sectors – Deutsche Annington, Boss and Bayer AG. Whilst all have seen their share price slide with the market in recent weeks, investors looking for liquid, large cap opportunities may want to consider Bayer on their investment horizon. In addition to a low relative valuation, OTAS identifies other supportive factors and potential short term catalysts for the stock. Bayers’ current 12m fwd P/E valuation of 16.6x is back at 2 year relative lows versus the Pharma sector and levels which have correlated with positive inflection in price. Additional support may also be provided by its 200dma. Bayer shares are +12% YTD yet have underperformed broader sector by -2.5% and are -16% off year highs seen in April. 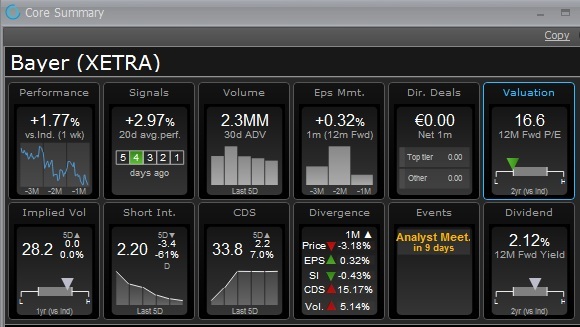 The shares are currently rated a consensus Buy and trade at -14.5% below the median analyst price target of €145, the widest discount compared to sector peers. Expectant 3 month volatility in Bayer shares is high compared to normal with options markets implying a +/-14% move in the shares. Levels of downside protection remain at year lows as does its current put ratio. Bayer is conducting an analyst meeting in New York in 9 days time and reports Q2 numbers at the end of July. If expectations are that these will be positive catalysts for the shares, Bayer may well currently offer a excellent entry point. One of the most popular new features within OTAS is the star ranking of directors, or insiders to use the US parlance, with regard to their share dealings. The directors who trade regularly and call the direction of the stock price correctly are awarded three stars and so on down through the ranking to those who don’t trade, or repeatedly get it wrong, who have no stars at all. Back at the beginning of the year I published a blog entitled China Insider Selling Back at Peak Levels, in which I used OTAS to show that net selling by insiders at Chinese stocks was back at 2007 levels. There had been no positive EPS Momentum over the previous three months, which had led to a sharp re-rating of Chinese shares. However, when we compared this move to a longer history of valuation, it became clear that there was still significant headroom for Chinese shares to rally. And boy, have they rallied. What is clear is that insiders at Chinese stocks had no more idea about what was about to happen than many other investors and commentators. Then as the rally developed, the number of voices that can be heard justifying the move and explaining why it will continue ad infinitum, has risen almost as quickly as the share prices themselves. Directors turned significant net buyers of shares earlier in the year, but in recent weeks have once again begun selling in size. Net disposals over the past month are $225m. Recent history teaches us to be sceptical about this general trend, which is where the OTAS star ranking comes into its own. By going to the Director Dealings page for any watchlist, you may rank transactions by the most recent and see whether the sellers are three star traders that you ought to pay attention to, or no star no hopers whom you are best to ignore. You build a picture of insider activity from the bottom up, observing in detail the shares where the C Suite knows what it is doing and skipping over the names where it does not. I am not aware of another platform that allows such insight into insider activity across a market or portfolio. 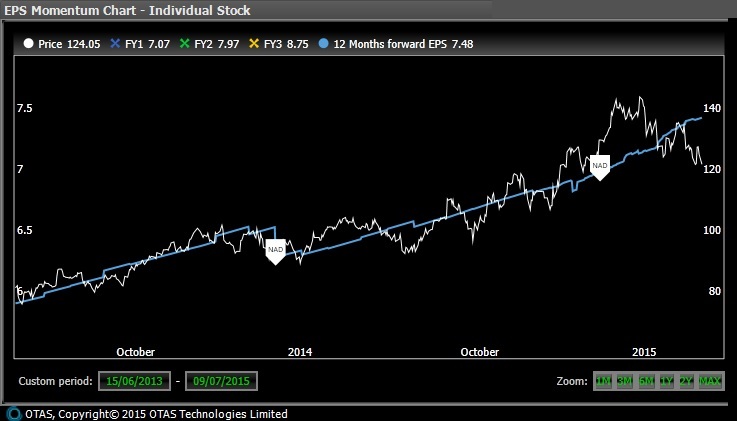 After a few years on the OTAS project, I am getting the hang of when and where EPS Momentum is a good guide to share prices. In the long run little else is supposed to matter, as the value of stock is its discounted cash flows, but in the short term both sector and market have a great bearing on how closely share prices track EPS Momentum. Western consumer stocks fluctuate modestly around the trend in one year forward earnings estimates, and at the outer edges of a normal range present excellent buying and selling opportunities. Chinese shares, as is well understood, are more typically a play on real interest rates and a substitute for interest bearing investment in a country where real returns on bank deposits have for long periods been suppressed. Throw in some deregulation, a few broker freebies for trading in Hong Kong and a general desire to diversify holdings of wealth internationally and you have the recipe for a proper bull market. Back in January Chinese stocks traded at 16.8x 12 months forward earnings, which was the highest level since early 2011. However, as noted, it was also 40% below the upper bound of the normal range for these stocks, giving plenty of headroom for PE expansion regardless of trends in EPS. Today, EPS Momentum is -0.4% and has been negative for the past three months, as was the case back in January. But these changes are small beer compared with the flow of funds pushing up stock prices and, on their own, will do little to dent the rally. Of greater interest is the forward PE, which now stands at 25.9x. The chart below shows that this has surpassed the top of the normal range, although remains some way shy of the two standard deviation point of departure and of the record valuation back in October 2007. For those looking to spread some optimism about Chinese shares, this index of stocks has 13% further to run before its revaluation reaches the two standard deviation level and there is the possibility of overshooting once we reach that point. So, are there any more cautionary measures to observe? In January, the first comparison made was with the Russell 1000, while noting that Chinese shares still had a long way to run if they were to return to previous relative rankings with US shares. Now in June, Chinese shares trade at an average premium of 45% to US counterparts, but this is within the normal trading range, which was last breached in 2009. Nothing to see here yet folks. Chinese shares are a little more stretched against Japanese and Australian shares, although as noted before they had not plumbed the depths against the Nikkei 250 compared to other indices. Once again it is left to a comparison with the HSI to see how far and how fast Chinese shares have risen and at last, here is our cautionary note. 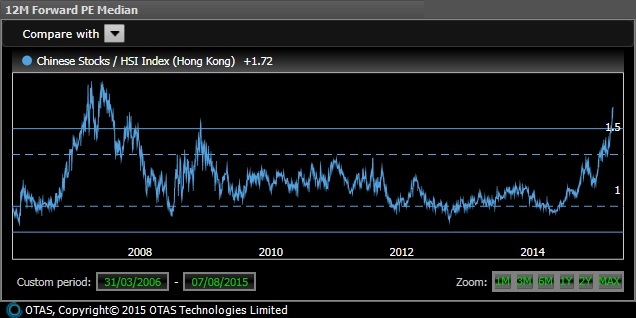 Chinese shares are more than two standard deviations above their average relative valuation compared to Hong Kong shares and trade at a 72% PE premium. The last time this was the case was in October 2007, by which time the relative valuation was definitely on the slide. One other observation that I made in January was that the dividend yield on Chinese shares was very much in the normal range for the stocks and that this was no reason for concern. 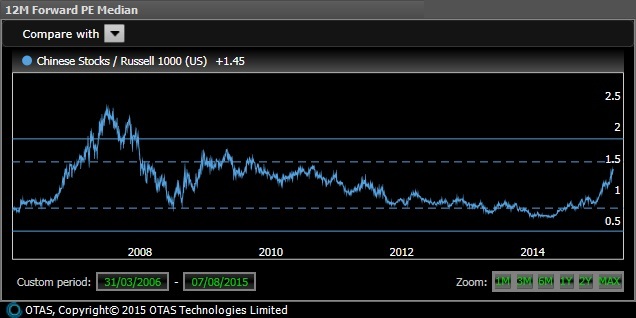 Now, in June, not only is OTAS flagging a two year extremely low level of yield, the long term chart is almost at the two standard deviation low of 1% average yield, which was brushed up against in September 2007. In fact, just 7bps to go. For those concerned with such long run measures as cash flow to shareholders and dividend yield, and there may be a few hidden amid the current frenzy, this is the warning sign that you have been waiting for. 65 of 262 stocks in my index yield at least two standard deviations less than normal and 141 yield below 1%. 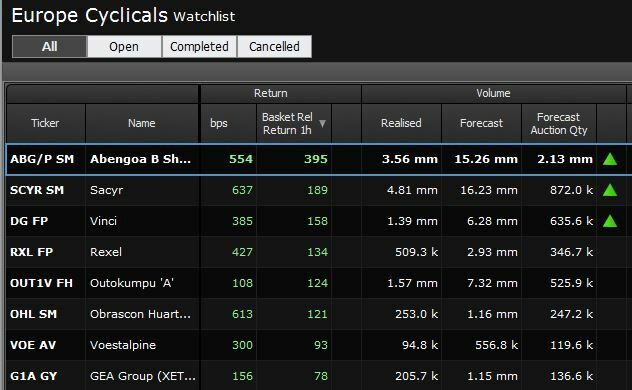 Check out OTAS for a list of names that includes mega caps such as Ping An Insurance, CSR and China Construction Bank. Posted in: New Product Features. The recently released OTAS Lingo stock reports are now fully automated and available in electronic format. Putting you in control, simply decide the time frame of analysis for a market or portfolio, the frequency of the report and a time of receipt and OTAS will do the rest. Based on your choices, a bespoke automated email will be sent providing you with a complete overview of all the standout activity in the stocks you care about. Simply click on the orange ‘Subscribe’ button at the top of your Lingo report…..
..then choose the time frame over which Lingo should collate the information (daily report, weekly report, Month To Date or a Calendar month,) the frequency with which you would like to receive it and finally at what time of day. View and create multiple reports via your most accessed ‘Top Lists’ on the right-hand side of the screen or mindshare content via the Social Media links. Analysing today’s Microstructure in Weir Group(WEIR LN) highlighted some obvious flaws in order flow strategy from the onset of trading this morning. Identifying others weaknesses makes your trading decisions easier, giving you the upper hand. Weir Group is a prime example of how you could have made/saved significant bps of slippage. By analysing live tick data it is possible to detect unusual behaviour compared to a stock’s typical characteristics and from this it is easy to determine your execution rate or whether to be active in the market at all. The return chart above highlights how a stock(white line) is behaving relative to a bespoke basket(green line) of correlated peers. 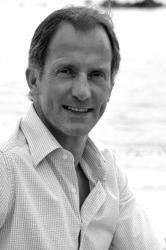 Weir Group has been pushed higher from the open whilst the basket is effectively unchanged. When considering how to react to such a move you have to consider the volume transacting. The second chart shows volume is trending extremely light compared to what would normally be expected at this time whilst the Traded Volume indicates an eagerness to cross the spread and lift offers. Conclusion – The early buyer of Weir Group has clearly adopted the wrong strategy indicating a potential ‘hollow rally’ in the shares. That is exactly what happened…. As the share price normalises the volume begins to pick up suggesting a greater willingness to get involved by the buyers. Unfortunately, they have already given the game away ! !